Every organisation has its unique process for inviting customers to fill-in and sign documents. Whether it's a recruitment on-boarding procedure, contract signing, renewal or signing-up for insurance policy or a loan, these proceedings carry lengthy, inefficient, and often costly consequences when customers omit a page or signatures, need to print or scan forms, or are required to travel to the company's offices. Secured Signing's customised workflow offers to transform paper documents into branded fill-in and sign electronic pages that enable companies of any size or industry to shift to a fully digital process. The Secured Signing workflow automates the paperwork process, ensuring the elimination of any human errors. The workflow apparatus sends an email invitation to an invitee to fill-in and sign all attached forms, whether it's a contract, policy, or any other type of document. On completion, all parties involved receive the completed and signed document. The Secured Signing system provides the document initiator with the flexibility to add / withdraw any receiving parties. Talk to us about your workflow needs, and a Secured Signing specialist will fit the best solution to meet your online process and workflow needs. Here's an example of one workflow illustration. Secured Signing can meet your needs whatever they may be, and cater for any type of business workflow. Once the workflow App is configured in your Secured Signing Account, additional buttons will appear on your dashboard screen. Click on the Workflow to start the process. 1. 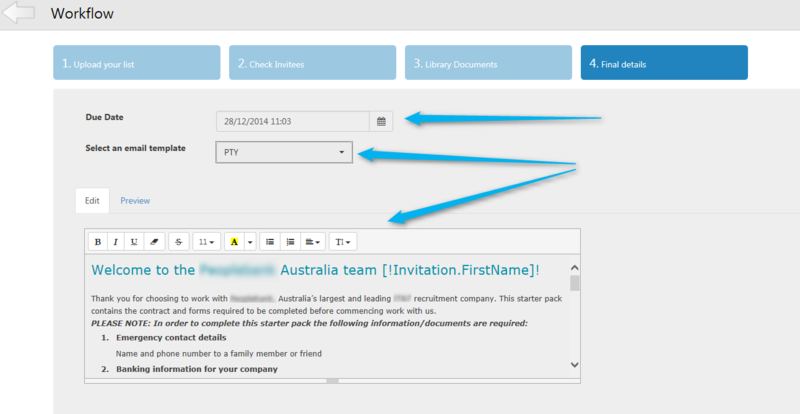 Add the file that includes your Smart Tags with invitee' details and workflow names. Smart Tags include instructions for Secured Signing, selected forms to add into email invitation package, signing order, mobile phone numbers, email template for invitation and compilation, and more. 2. Check and review your invitee's details; if update is required, please do it now. 3. Select from the list the marketing flyers / policies / guidelines you want to add to email invitation. 4. Setup the due date for signing completion. The system will send out reminders accordingly. Now select the email template and edit it, or write a personal message and then press finish to start the workflow process.